50 years ago, on this day.. March 28, 1963. A great and wonderful film made its debut. A thriller, being a masterpiece of horror, suspense. This film was directed and produced by Alfred Hitchcock, and will never be forgotten. This film is also a personal favorite of mine. 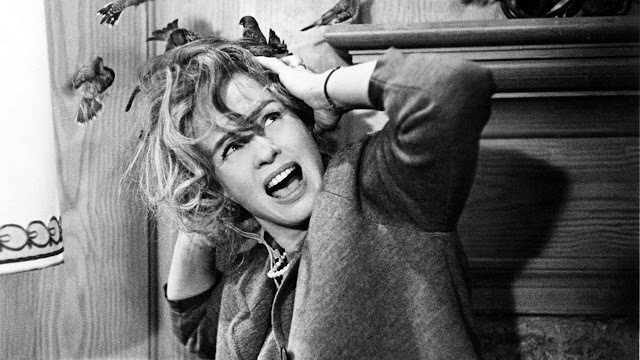 The Birds, broke out and terrified audiences everywhere.The brilliant editing, silent lack of musical score, vicious special effects, and overall paranoid tones developed fear, excitement. The story itself, demanded questions. Why are these birds attacking? Will they stop? Is this a sign of the Apocalypse? Can our star players in this drama escape? Can we escape? Imagine being among the first to witness The Birds in its opening days on the big screen. I could imagine, and emotional tension to be stronger than my first viewing. I shivered in my childhood watching this, curious about the idea while after putting down my TV guide. I felt uneasy about birds for a while. Outside my apartment in San Francisco, I was often startled, excited when many birds gathered usually for bread crumbs in the park. After seeing this film, I believed they could attack or kill me. I still do, as anything could happen in our interesting days. So today, I learned of its 50th anniversary and did some browsing. I found these fun promos on Youtube, shared below. Enjoy! Posted on March 28, 2013 by Orion T.	This entry was posted in Interests and tagged Alfred Hitchcock, angry birds, birds, classics, film, history, horror, the birds. Bookmark the permalink.